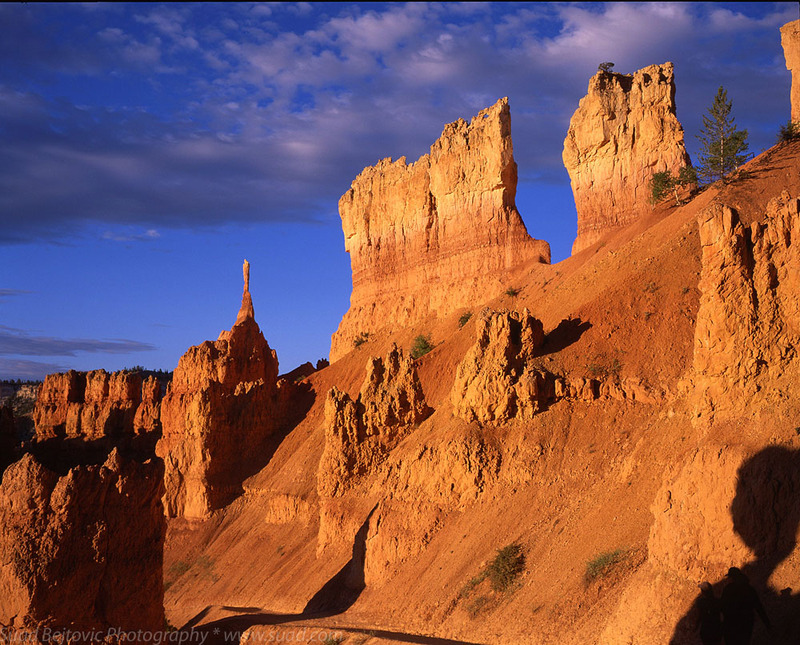 Utah Rocks, Part I: Bryce Canyon National Park «Suad Bejtovic Photography etc. Suad Bejtovic Photography etc. 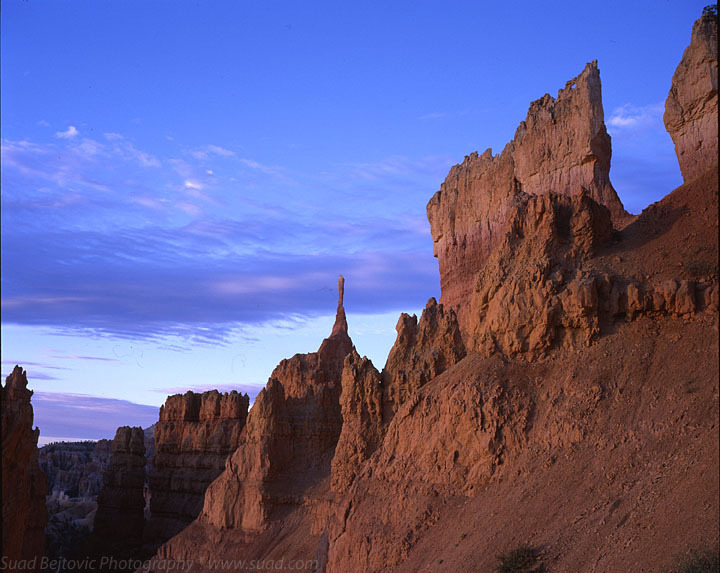 Bryce Canyon National Park is one of my favorite places to watch the sunrise. 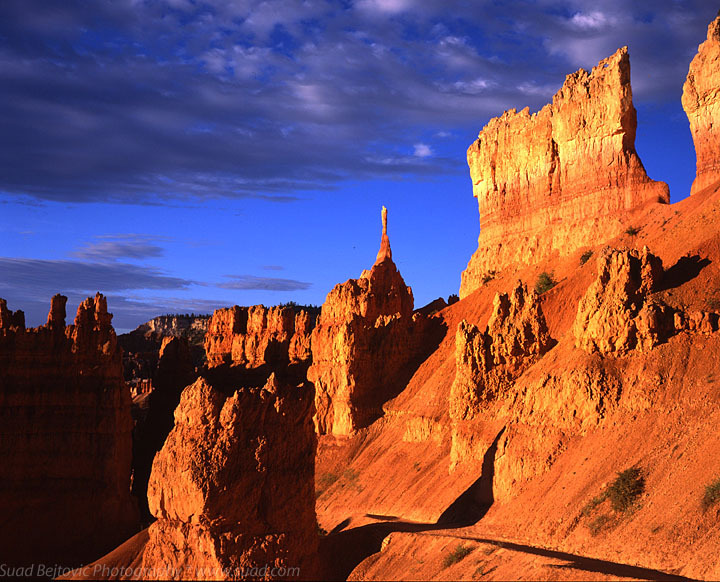 It’s more of an amphitheater than a canyon, and it’s facing east, so the morning sun lights up the endless rock formations known as hoodoos. The resulting color palette is a sight to behold. I shot sunrise at Bryce on two separate earlier trips, but when I decided to attend a conference in Las Vegas in June 2013, I knew I would want to do it again. And so, after the conference wrapped up, I rented a car, and made the 4-or-so-hour drive into the mountains of Utah. I stayed only two nights, which meant two attempts at a sunrise. The first morning I stayed at the rim and shot pretty much the same composition as I did a few years ago. As it happens, that’s been one of my most successful photos ever, so I didn’t improve on it. The second morning I decided to walk down the trail and among the hoodoos. The shot was set up so that the Thor’s Hammer, a famous rock formation, was behind me. In front of me was the slender spire called The Sentinel, and some rock cliffs on the right. The horizon to the east was muddled with some clouds, but in a fortuitous moment, the sun shone through and lit the cliffs perfectly. As it would turn out, in that fortuitous moment, two hikers leisurely walked into the bottom right corner of my frame. Since my Mamiya 7 is a rangefinder camera, I didn’t notice them through the viewfinder, but the lens definitely did, since it sits down and to the right from the viewfinder. I didn’t feel like editing them out until I’m ready to display the photo at an exhibit or something, so I took another shot, shown here in the smaller format. The composition isn’t quite what I’d like, but the colors are still spectacular. In fact, they look even more saturated here due to the fact that I scanned that frame with a little less care than the main photo above. Another bonus shot is of the same composition, taken while the sun was obscured by the clouds. It’s just another proof of my “Formula” for a successful shot, which states that you need only Fuji Velvia 50 film and “golden hour” sunlight; the subject almost doesn’t matter. Here’s the same subject under two lighting conditions only moments apart, and while it looks nice on one shot, it really comes alive in the other.